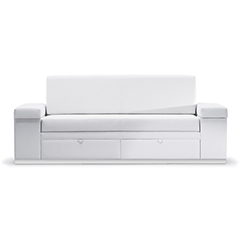 The innovative SleepOver Flop Sofa transforms from a generous lounge into a comfortable bed to accommodate guests who are staying at the patient’s side day or night. A simple two-step process “flops” the cushions down to reveal a separate sleep surface that fits within the same footprint. Integrated storage compartments keep bedding and other items handy. Five styles complement a broad range of environments.